When the Teen Titans go to the big screen, they go big! 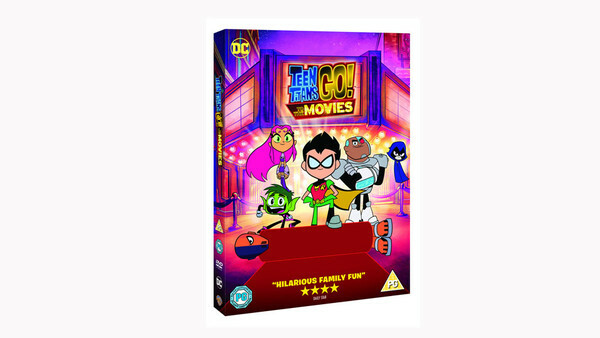 From Warner Bros. Home Entertainment TEEN TITANS GO! TO THE MOVIES finds our egocentric, wildly satirical superheroes in their first feature film extravaganza. To celebrate its release on Digital Download and DVD on November 26 we’re giving a DVD copy of the film to 3 lucky winners. The first-ever big-screen version of DC Entertainment and Cartoon Network’s animated TV show stars Greg Cipes (TV’s 'Teenage Mutant Ninja Turtles') as Beast Boy, Scott Menville (TV’s 'Spider-Man') as Robin, Khary Payton (TV’s 'The Walking Dead') as Cyborg, Tara Strong (the 'My Little Pony' franchise) as Raven, and Hynden Walch (TV’s 'Adventure Time' with Finn & Jake) as Starfire, reprising their roles from the series. Will Arnett ('The LEGO® Batman Movie') and Kristen Bell ('Frozen') also lend their voices as the evil Slade and Hollywood director Jade Wilson. This character is the arch-nemesis of the Teen Titans. And please don’t confuse him with Deadpool. Name this character voiced by Will Arnett. TEEN TITANS GO! TO THE MOVIES arrives on DVD & Digital Download November 26th, and will be available on Blu-ray exclusively at HMV. Competition closing date: 15th December 2018.